Modify a checksum (e.g. a CRC) that is transmitted from the slave to the master. This can be helpful to verify if the system recognizes the error. Assuming you have an I2C transfer between a master and a slave. From the functional view the slave behaves like a memory (e.g. an EEPROM) and has the address 0x50. In the 2nd message the master sets the address pointer and then requests 3 bytes from the slave with a combined message. 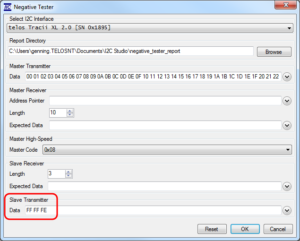 Now open a telos I2C Negative Tester window in I2C Studio and change to the “Slave” tab. Now the Negative-Tester slave is configured to set the LSB of byte to ‘0’ (FE) and leave the first two bytes untouched (FF). Enable the slave by pressing the “Start” button (the address of the slave should be also 0x50). At this moment there are two slaves with the same address active on the bus: The original memory slave and the slave of the Negative-Tester. In the following transfer the bit manipulation is clearly visible: The slave of the Negative Tester has set the LSB of the 3rd byte to zero which results in data byte 0x32 instead of 0x33 that is sent by the original memory slave (see screenshot “Negative Tester Trace”). Please note that the slave of the Negative Tester repeats its data array if more bytes are requested than defined. Hence you should fill up the data array with as much as 0xFF data bytes as requested by the master.